Happy Monday everybody! 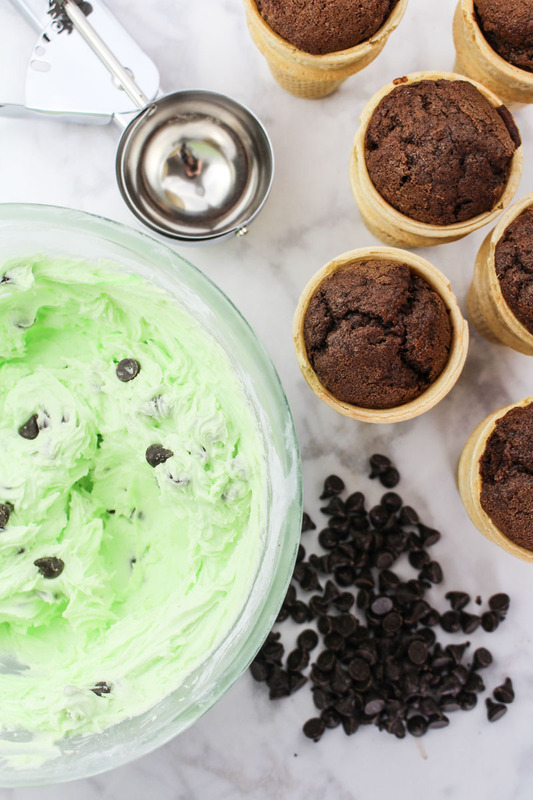 Yeah, so what if it’s been raining all weekend, it’s time to summer-up and get making these Mint Chocolate Chip Cupcakes – baked in adorable ice cream cones ? Yep, that up there is mint choc chip buttercream, not actual ice cream. I promise. The idea for these cute little guys came whilst I was in the kitchen creating last week’s mint chocolate chip cookies. I really loved that the peppermint flavour of the cookies was way more yummy than the toothpaste flavour I was imagining, so I set about brainstorming some more minty recipes to share with you all. So let’s start at the beginning. The cupcake batter hidden beneath the mound of buttercream is chocolate. I considered adding some mint in there too, but you can have too much of a good thing if you’re not careful. The cupcake batter is pretty much stolen straight from my best ever chocolate cupcakes recipe, because why mess with perfection? I was a little concerned that the ice cream cones wouldn’t cope with being baked all that well, but I really shouldn’t have been. No burning and no soggy bottoms either. Baking wins all round this weekend! I chopped the domed tops off the cupcakes, because it is so much easier to frost them this way. Make sure you only fill the cones about three quarters full to try and avoid any batter over-flow – these cupcakes will rise more than you expect. I popped my ice cream cones into my usual cupcake tray to try and keep them upright, but if you’ve got a steady hand then you should be okay with just putting them on a baking tray. Enough with the cupcakes though, that’s not the exciting bit here. The buttercream is the star of the show – I can’t quite get over how much it looks like real life ice cream. I think luck was on my side in the kitchen on Saturday, because I managed to get the exact right shade of minty green on my first try. If peppermint isn’t your thing, then you can always omit the peppermint extract and add in a teaspoon of vanilla to keep things a little more civilised. But if you know me at all, you’ll know that when I do things, I like to go all in. The buttercream is light and fluffy, and filled with dark chocolate chips. The best way to get the ice cream look is to use an ice cream scoop to get it on there – preferably the sort with the trigger that helps get the ice cream out. Place the scoop of buttercream on top of the ice cream cone, press down, and you’ll pretty much be done. Easiest frosting experience ever. Anyone can do this, even if you have zero confidence in your icing ability! If you want to make these cupcakes in normal cupcake cases instead of cones, then you can 100% do this. The recipe below will fill the same amount of cupcake cases as it does cones, and they will turn out just as tasty. 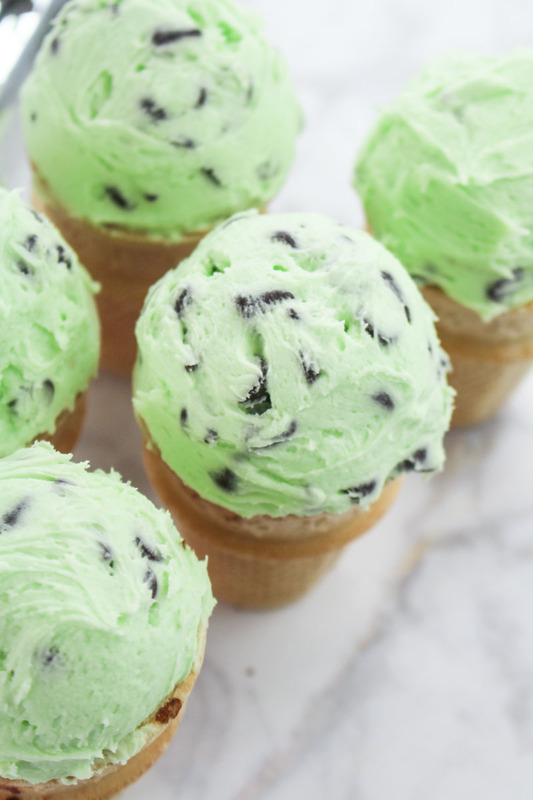 But I think there’s something really special about these ice cream cone cupcakes, so I encourage you to pick up some cones next time your in the supermarket. I’ve still got half a box of cones left, and a wild imagination, so I expect some more ice cream cone baked treats will be arriving on What Charlotte Baked before the summer is out. Speaking of summer, I’ve got a bunch of fantastic recipes planned for the next few months, and am beyond excited to share them all with you ? 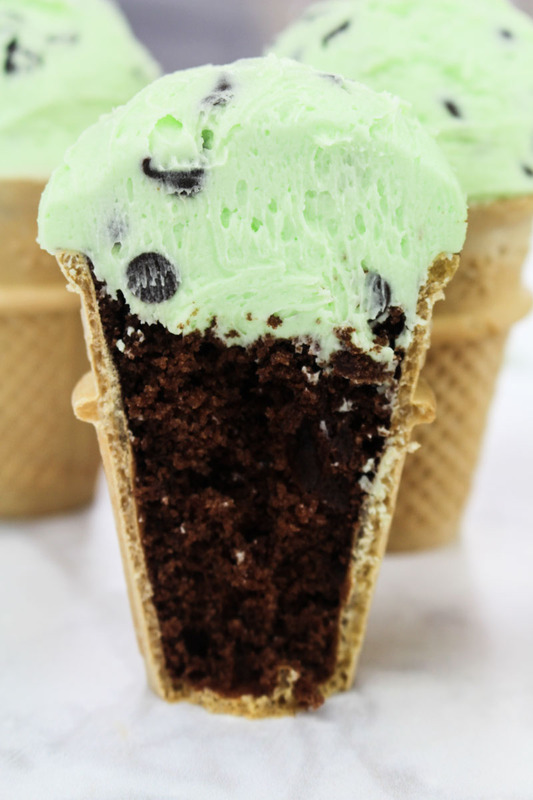 Chocolate cupcakes baked inside ice cream cones, topped with mint chocolate chip buttercream. The cutest little cupcakes to eat this summer! Preheat the oven to 180°C / 355°F (160°C fan) and place 14 ice cream cones onto a baking tray. Melt the chocolate, either in the microwave or over a saucepan of boiling water. If using the microwave, make sure to stir the chocolate every 20 seconds to avoid burning it. Set aside. Cream the butter using a stand or hand-held mixer, until it is pale and creamy, and has no lumps. Add the sugar and beat well. Add the eggs one at a time, mixing well between each addition. Then add the melted chocolate, and mix until smooth. Add the flour, baking powder, bicarbonate of soda and salt, and mix gently until just combined. Try to avoid over-mixing. Pour in the milk and vanilla extract, and mix gently until fully combined. Carefully fill the ice cream cones ¾ full, trying to avoid spilling the batter on the outside of the cones. A teaspoon is good for this! Put the cones in the oven for 20-25 minutes, or until a skewer or toothpick comes out clean when inserted in the middle. Leave to cool completely on a wire rack before icing. Chop the tops of the cupcakes off so that the cupcake is level with the top of the cone, as this will make them easier to frost. Place the butter in a medium bowl and whisk using a hand-mixer, or in a stand mixer with the balloon whisk attachment. Whip the butter for at least three minutes, until fluffy and smooth. Add about a third of the sifted icing sugar and whisk together. Add three tablespoons of milk, and whisk. Put the rest of the icing sugar into the bowl (or you can do this in two additions) and whip for a minute or so until the buttercream is fluffy and light. Feel free to add a little bit more milk if necessary. Add the peppermint extract and green food colouring, and whip until the buttercream is an even mint green colour. Add the chocolate chips, and mix together until the chocolate chips are evenly distributed. 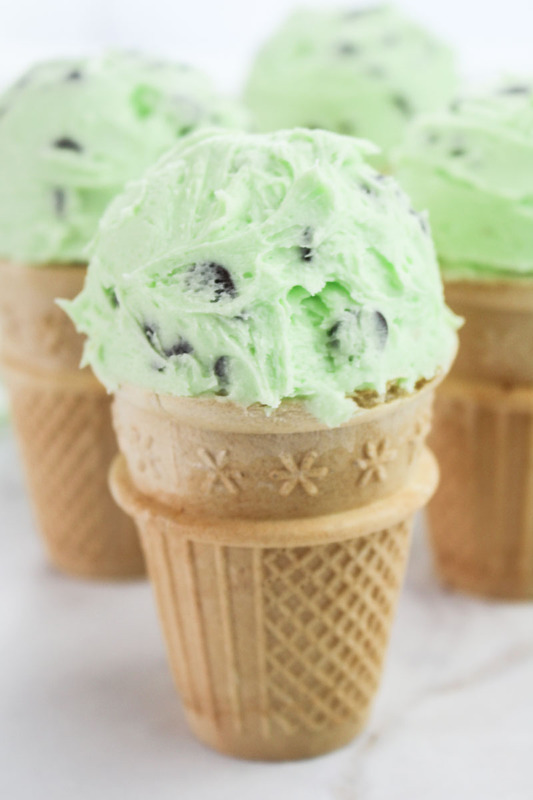 Using an ice cream scoop, or a spoon, place a scoop of the buttercream on top of each of the ice cream cones. Using a small spatula or knife, neaten up the join between the cone and the buttercream, so no cupcake is visible. The cupcakes will stay fresh for 3-4 days if stored in an airtight container in a cool place. Really tasted like mint choc chip ice cream as well, I don’t even know!